Note: This procedure involves editing a game file; create a backup copy of the file before proceeding. Use a text editor to edit the "TKGRAPHICSSETTINGS" file in your Steam Apps folder or the "\Documents\My Games\No Man's Sky\Binaries\SETTINGS" directory. Find the "<Property name="RemoveBaseBuildingRestrictions" value="false" />" line and change the "false" to "true". This will remove the "Limit Reached" message, allowing you to build an unlimited number of base parts on your plot. Find the "<Property name="BaseBuildingLimit" value="2000" />" line and change the "2000" to "1999". This will increase the size of your base building plot. Changing this value will multiply the amount of space you can build on. Then, save and close the "TKGRAPHICSSETTINGS" file. Step 1: Place the item(s) you want to duplicate in your ship's inventory. Everything you put in your ship will be duplicated -- allowing you to duplicate multiple items at once. Everything you do not want to duplicate can go in the exo suit or be sold. Step 2: Get in and out of your starship two times in a row. This will create two save points. Check manually under "Options" in the pause menu to confirm that it shows both saves with the same timestamp. Step 3: Get yourself killed while flying your ship. This is best done by attacking a space station. Step 4: When you respawn, reload your previously saved game in the options. This will put your item(s) back in your inventory and your grave will still be there as well. The grave has a duplication of your ship's inventory. Step 5: Collect your grave to get your duplicated item(s). Repeat this as many times as desired. The more duplicates you have in your inventory, the faster it will go. You can do this to get lots of Warp Cells and reach the center of the galaxy very quickly. You can also duplicate Gold and Emeril to get millions of units in just a few minutes. The larger your ship's inventory, the more effective it will be. So make sure to reinvest your money in a larger ship at first. This exploit will also help you to get "The Diamond Age" (have 2 million units) and "A Space Odyssey" (warped 60 times) gold trophies. Note: This exploit/glitch was performed on Patch 1.03 of the game. It will eventually get patched. To avoid not being able to use this exploit, either do not install new patches before using this exploit or delete the patches. You can avoid patches being installed by disconnecting from the internet until you are ready for the game to install new patches. In any space station, enter and exit your ship twice to create two identical save points. Purchase the desired ship. Then, enter the options screen and reload your previous save to get your money back, have the same exact inventory slots and upgrades as your previous ship, but it will look like the one you bought. Note: This exploit/glitch was performed on Patch 1.03 of the game. It will eventually get patched. To avoid not being able to use this exploit, either do not install new patches before using this exploit or delete the patches. You can avoid patches being installed by disconnecting from the internet until you are ready for the game to install new patches. Shoot asteroids near a space station to mine their elements, return to the space station, sell everything, and repeat as many times as desired. This is the fastest and easiest method to getting money -- and it works anywhere at any time. There are infinite asteroids. Some of them even contain rare metals that sell for much higher prices, but mostly you will find thamium. It is not worth much, but the fact that you can get 100 of them in one second is worth the trouble (100 thamium is worth 2,000 units). You also do not have to wander off too far from the space station since there are asteroids everywhere. This is best done in a solar system with high thamium prices. Make sure you have a clean inventory in your ship and suit. Make lots of Bypass Chips and sell them. They only cost 10 plutonium and 10 iron to make, and the blueprint is unlocked from the start. They are the two most common elements. While 10 of these elements are worth almost nothing, a bypass chip is worth 3,500 units. Obtain a lot of iron and plutonium, go to a space station, craft bypass chips, and sell them until you run out of resources. Then, repeat the process. You will make 35,000 units from 100 plutonium and 100 iron (selling the elements alone would give you only 5,000 units). Visit Atlas Interfaces (formerly Atlas Stations) and get the Atlas Stones. They sell for 70k units (after patch 1.03). Before the patch they sold for 270k. Stack up on rare metals (gold, titanium, etc.). All the elements with a green background color are worth a lot. Gold is the best one. Some planets have a lot of gold. This is random, but if you find such a planet, you should take advantage of it. Gold usually comes in the form of giant rocks. You can find a lot of it on radioactive planets. Everything you discover can be uploaded (and renamed) when connected to the game servers. You will get money for doing this. This is helpful for getting things going early in the game. When the current space station does not offer a good price for your stuff, sell it at the next station. In the third solar system (after warping two times), you must use your ship's scanner to locate an Alien Monolith. The monolith will be marked with a purple icon on one of the planets. This is after you have learned how to craft the antimatter and warped to the next star. Interact with the Alien Monolith to mark an Atlas Interface on your map. Warp to the Atlas Interface. In the Atlas Interface, you must talk to the large orb and choose to "Concent." Do not refuse the orb. When you pick the correct option, it will give you an Atlas Stone. Space Anomalies will now randomly appear when you travel to new solar systems. You may have to warp many times before finding one. It is random and one will eventually appear. It is recommended you stay on the path the game gives you. When you reach a new system, always use your scanner. If a Space Anomaly is nearby, it should get marked with a purple icon. Inside is an Alien scientist. Talk to him to get the Atlas Pass V1 crafting formula. Then, craft it for 25 x Iron + 10 x Heridium. The Atlas Pass gives you access to the side rooms of Space Stations. These contain upgrades for your multi-tool and exo suit. Some locked boxes can also be opened with it that contain rare materials such as Suspension Fluid, Electron Vapour, Antimatter, and Warp Cells. Note: It does not matter which path you choose at the beginning of the game (or if you choose one at all). The directions above are the same regardless. 1. Upgrade your Hyperdrive to warp 300 LY instead of 100. Even more is possible with a second upgrade. 2. Use a black hole. They will teleport you 2,000 light years closer to the center. This is by far the quickest way to travel. 3. Warp to Atlas Interface and collect the two Warp Cells and Atlas Stone. Every Atlas Interface has two free Warp Cells -- so you do not have to craft them. 4. Repeat steps 2 and 3. Collect the two warp cells from Atlas Interface, use them to get to a black hole, and repeat. Later when you have the Atlaspass V3, you can find fuel resources (Suspension Fluid, Electron Vapour, Antimatter, Warp Cells) in the back room of space stations. The V3 pass is only available when you are much further into the game. Once you have it, this basically gives infinite warp cells. You would buy Zinc and Heridium from the station, open the locked canisters in the backroom for fuel ingredients, and craft them together into a Warp Cell (Plutonium is also found in the backroom; you must get Thamium yourself by shooting a few asteroids). Additionally, keep stacks of Plutonim, Heridium, Zinc, and Thamium in your inventory. They are needed to craft fuel related items. Note: If you want to get to the center even quicker, delete the patches and play Version 1.00 of the game. You will start only 40,000 lightyears away from the center (with the patch installed you start 175,000 lightyears away). Also, you do not need the Atlaspass V3 in the unpatched version to get unlimited fuel resources. The Hyperdrive allows you to jump from one solar system to the next. The following two strategies are the best ways to upgrade it. While exploring planets, you will notice smoking drop pods (Damaged Machinery). They usually contain upgrades for your ship. If you are lucky, you can get an upgrade for the Hyperdrive. Fly close to the surface and watch out for black smoke and blue blinking machinery on the ground. Also, talk to the alien at every space station you visit. The weirder the conversation and the higher your standing with a faction, the better the possible reward. For example, on the right wing of a space station you could meet an alien from the Korvax Race. During the multiple choice dialogue, you can select whether to let him extract some of your brain cells or not (for his research). If you agree, which temporarily depletes your shield, you will be rewarded with the "Warp Reactor V1" upgrade. When you have dialogues with really weird (or life threatening) options, it is recommended to agree to the most risky requests since these options give the best rewards. Unfortunately, there is no 100% full proof method to get the upgrade right away. It will take some time and comes down to luck. Try to give the correct answer in all alien dialogues. This will increase your standing with them and lead to better rewards. Atlas Stones are a very valuable item. You can find them at Atlas Interfaces (formerly Atlas Stations). Talk to the large orb inside the station to get one Atlas Stone. You can get one Atlas Stone at every Atlas Interface you visit. They are worth 70k units after patch 1.03 (before the patch they were worth 270k). Other than selling them for money, they have no use in the game. A nice benefit of Atlas Interfaces is that they also give you two Warp Cells, teach you new alien words, and give you Exosuit blueprints. At the start of the game, the Atlas Interfaces (formerly Atlas Stations) are blocked. In the third solar system, you enter a monolith that will be marked automatically with a purple icon (do not confuse it with the small stone pillars that unlock new words). The monolith is a large stone altar. Interact with it to get one warp cell and have an Atlas Station get marked on your star map. This is a scripted event and part of the storyline. If you ignore the monolith in the third star system, another one should appear in the next one. Once the Atlas Station is marked, you just need to follow the purple line on your star map. After finding this story-related station, you must find them by yourself. They will either appear as anomalies when one is nearby, or you have to look for a star surrounded by three blue arrows, like in this image. 100 x Plutonium (mined from crystals on planets, or buy it at space stations). Heridium is a Silicate element, commodity, and crafting material in the game. It is used to craft Antimatter and some upgrades. It can be found on planets and mined from tall rocks. These are quite common. You can fly close to the surface with your starship to spot them. They give hundreds of Heridium per rock. It can also be bought at any space station from the trade terminal and merchants. They usually sell 20-50 Heridium (you need 50 for crafting Antimatter). You can rename all your discoveries: star systems, planets, animals (creatures/monsters), plants, and waypoints. You can make discoveries after crafting the Analysis Visor for your Multi-Tool (press L2 to analyse environment). To rename all your discoveries, press Options. Then, scroll over the solar system or planet you want to rename. On the planet discovery page are sub-categories for the animals, plants, and waypoints you have discovered on that planet. Only after selecting the planet in the menu can you rename the things you found on it. There is also a progress overview for every planet. It shows you the percentage of discoveries you have found. Each discovery is worth money. Discovering everything on a planet can give you well over 250,000 units. This largely depends on how many things there are to find on a planet. The bigger it is, the higher the reward for completing it 100%. Additionally, all players that stumble across your discoveries later will see what you named them and that you were the first to find them. The game automatically creates a saved game whenever you exit your starship (for example, land on a planet or space station). You can quickly enter and exit your ship to create a restore point. There is no need to fly around and land again. Simply get in and out of it. While there is no menu option to save, you can create manual saved games by visiting waypoints on the surface of planets. They are marked as points of interest with a green question mark. Use your ship's scanner to find these points of interest quickly. They look like small beacons/antennas. The game counts them as discoveries. You can save your game there as often as desired. After talking to an alien once, talk to them again and give them 20 Carbon. Every other time you do this, you can request to learn a new word from that alien's race. Every third time you do this, you can ask them for 78 Carbon. Repeat this as many times as desired to learn every word from that alien's race. To learn unlimited words from a specific faction (Gek, Korvax, or Vy'keen), do the following. Have at least 20 Carbon with you to initiate a conversation with any NPC you come across. After talking to them, they will give you three options. It is usually fuel, shield recharge/health recharge, or learning a new word. If learning a new word appears first, select it. The next time you talk to them, select the fuel option to get your Carbon back. Talk to them again and the option to select a new word should appear. Basically, every other time you talk to the NPC, you will have the ability to learn a new word -- and if you get lucky with the fuel option in-between, you will never run out of Carbon to keep the conversations going. This also works well if you are trying to get "The Sentinel" achievement on an extreme planet since you can now gain the full vocabulary while waiting. 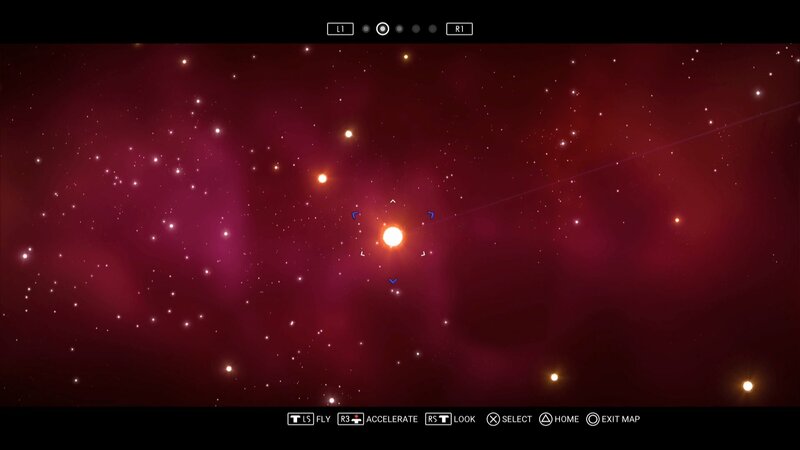 Collect the glowing orbs in Atlas Interfaces (you can get 5+ new words per Atlas Station). Interact with the large stone pillars on planets. They will be marked with a purple symbol. Use your scanner to locate them quickly. Some planets are filled with them. They are relatively rare on other planets. When you see a lot of them appearing on your scanner, there is usually more nearby. Talk to aliens (for example, in space stations). Sometimes during multiple choice dialogues an alien will teach you new words when giving the correct answer. This is very random and usually they give you upgrade recipes instead. You can try talking to them several times in a row by giving them 20 carbon. They will do something to help you out –- like refill your health, shield, etc. or teach you a new word. Knowing new words will make dialogues easier. Plus, giving the correct answer can yield very good upgrade blueprints. The higher your standing with a faction, the better rewards you can get from them. To return to previously discovered areas, select hyperdrive/warp while flying in space. Select the "Search For Discoveries" option at the bottom left of the menu. Note: You must be connected to the game's online servers for this to work. While the game is searching, the "Show Nearest Discovery" option will appear in the bottom left corner. Your map will teleport you to your nearest discovered galaxy. You must be in open map mode for this to work. You can then select a waypoint to be added, and the game will automatically generate a path of warps to be taken to return to this galaxy. To swim very fast, you must be moving really fast before hitting the water, and cannot bump into any objects in your trajectory once under water. The best way to do this is to fall from a really high height. Go to the shore, perform a Melee Dash with the Jetpack Jump and keep going up until your jetpack runs out, then keep holding forward once you hit the water. You can then turn and pitch your camera into any direction to maintain your falling velocity underwater. If you are in an underground cave and cannot get a lot of height, use sprint and Melee Dash into a bunnyhop to build up a lot of velocity before you hit the water, then point your camera into the trajectory you want to go once you are underwater. If you perform a melee attack while strafing, it is like a hidden quick dodge move. It is useful for dodging sentinel fire. If you perform a melee attack while moving forward, you gain a quick forward dash for a second. Melee while moving forward and while standing still in the middle of the melee animation do a quick jump to perform a quick bunnyhop dash forward. Maintain your height with the jetpack to cover a very long distance quickly. You have to quickly jump after melee to get this to work (at least within a quarter second of pressing [Melee]). This can also be applied in strafing directions as well. A Scanner Darkly: Attain 'Naturalist' status in Uploaded Discoveries. A Space Odyssey: Attain 'Discoverer' status in Space Exploration. Babel-17: Attain 'Confused' status in Words Collected. Citizen of the Galaxy: Attain 'Babelfish' status in Words Collected. Contact: Attain 'Known' status in Alien Colonist Encounters. Foundation: Attain 'Entrepreneur' status in Most Units Accrued. Galapagos: Attain 'Encyclopedia' status in Uploaded Discoveries. Have Spacesuit - Will Travel: Attain 'Adventurer' status in On-foot Exploration. Pattern for Conquest: Attain 'Notorious' status in Ships Destroyed. Stranger in a Strange Land: Attain 'Robust' status in Longest Lifespan. Symphony For A Lost Traveler: Attain 'Nomad' status in On-foot Exploration. The Diamond Age: Attain 'Magnate' status in Most Units Accrued. The Forever War: Attain 'Legend' status in Ships Destroyed. The Languages of Pao: Attain 'Interpreter' status in Words Collected. The Longest Voyage: Attain 'Pioneer' status in Space Exploration. The Sentinel: Attain 'Everlasting' status in Longest Lifespan. The Space Merchants: Attain 'Trader' status in Most Units Accrued. The Star Beast: Attain 'Archivist' status in Uploaded Discoveries. The Stars, Like Dust: Attain 'Trailblazer' status in Space Exploration. Use of Weapons: Attain 'Novice' status in Ships Destroyed. What Mad Universe: Attain 'Ambassador' status in Alien Colonist Encounters. Who Goes There? : Attain 'Diplomat' status in Alien Colonist Encounters.